On July 1, Emirates celebrates the seven-year anniversary of the Prague-Dubai daily service, with the number of passenger carried on the route since its inaugural flight in July 2010 rising above the 1.5 million mark. The Prague-Dubai route has proved so successful that on 1 May 2016 Emirates became the first airline to operate the world’s largest passenger aircraft, the Airbus A380, on a scheduled daily service into the Czech Republic. 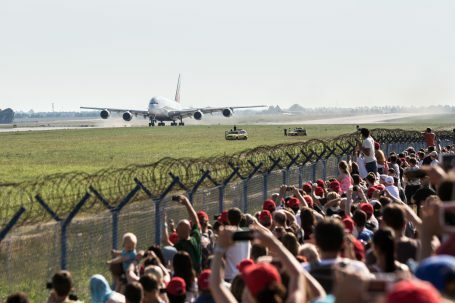 The introduction of the A380 on the route represented at the time a 44% increase in passenger capacity. The Emirates A380 accommodates 519 passengers in a three-class configuration, with 429 spacious Economy Class seats on the main deck, 76 fully flat-bed mini-pods in Business Class, as well as 14 First Class Private Suites on the upper deck. As well as enjoying Emirates’ renowned service, Czech business and leisure travellers today benefit from greater opportunities to connect seamlessly with Emirates’ 150-plus destinations around the world, through one single stop in Dubai. As well as Dubai itself, Czech passengers can reach popular destinations further afield such as Bangkok, Hong Kong, Taipei and Mauritius exclusively on this spectacular aircraft with just one stop. The A380 Prague-Dubai service offers passengers in all cabin classes Emirates’ peerless service provided by a multilingual crew representing more than 130 nationalities, savour gourmet cuisine and an award-winning inflight entertainment system, ice, which offers more than 2,500 channels of films, TV programmes, music and podcasts. Passengers traveling on the A380 can easily stay connected to family, friends and colleagues with a wide range of communications options including onboard Wi-Fi. The Emirates experience begins with a complimentary chauffeur-driven car to and from the airport for Business and First Class passengers, followed by access to Emirates’ exclusive airport lounges worldwide. As with all Emirates flights, passengers benefit from a generous baggage allowance of up to 35kg Economy 40kg in Business Class and 50kg in First Class.